How Its New York: Peter Quinn’s The Man Who Never Returned oozes New York. It’s a central character. And Peter is President of the Irish American Writers & Artists, whom we love and adore. How Its Irish: Irish-American Quinn produces an Irish-American shamus, Fintan Dunne. 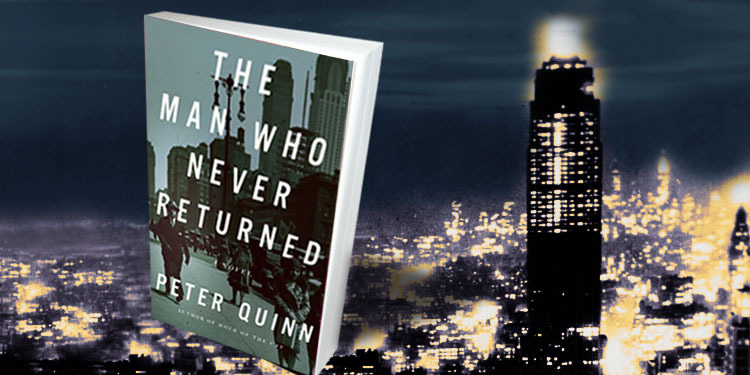 “Based on the still-unsolved case disappearance of New York State Supreme Justice Joseph Force Crater who entered a taxi on August 6th 1930, and was never seen again, The Man Who Never Returned is a novel,” Peter Quinn writes. Above all, there’s the man who has returned – Fintan Dunne, the private eye hero of Quinn’s previous unputdownable novel, The Hour of the Cat . Dunne’s flaw was that, in his previous life, not only had he been an Irish cop, but an honest Irish cop. Mostly set in 1938, there were Nazis and eugenics, spies, and tough ladies who either kissed you or ate you up for lunch. What haunts Quinn in The Man Who Never Returned is the idea that someone can vanish just like that. And at least Justice Crater is remembered for vanishing, unlike the rest of us who might vanish from the world and be forgotten. Dunne is hired to re-open the case of Justice Carter twenty-five years later by a media magnate who’s opening up a new tabloid and wants a splash. Dunne knows it’s not kosher but, despite having retired with his femme fatale to Florida (I loved that idea! You actually can imagine a retired Bogart and Bacall sipping martinis by their pool, their skin a toughened walnut), can’t resist coming out of retirement to work out why. Quinn’s writing cracks and whips itself through the underworld, the cops, the city. It surpasses the expectations – and limitations – of the genre, making you, as a reader, want to know more. About New York, and about the characters – Dunne, and his past in the OSS; Crow and his love of Dante; Roberta, the retired femme fatale (and her dance teacher); and Miss Renard with her “sly slant to her wide eyes” – one fox that won’t be caught. The hardboiled detective voice is harder than it looks to get right; it can rapidly grow old, but Quinn brings a freshness and vitality, as well as real inquisitiveness to it. The Irish-American take on it steers clear of the drunk Irish cop cliché and pries open the combustive mix of Irish control in the force and in local politics with the latent racism against the Irish. In Hour of the Cat, the powerful Donovan (Dunne’s officer in WWI and his chief in the OSS) is given a book on eugenics where he discovers a chapter on the inferiority of the Irish; his political career in the thirties will be limited by his being Irish. The shadow of the world wars hovers over the two Dunne novels, suggestively making you think about how those wars gave rise to the genre itself. German expressionist filmmakers in exile in Hollywood defined film noir, but it made me think about the mirroring of the threat and violence of those wars in the chiaroscuros of Raymond Chandler (who fought in the trenches in France in WWI) and Dashiell Hammett (who was in service in both WWI and WWII). Decent contemporary writers such as Alan Furst and Philip Kerr have mined the WWII territory to good effect, but I think Quinn does better. Quinn is writing a third Dunne novel. Justice Crater may have taken a tan cab out of the city, and perhaps (read the book!) out of this life, but I’m thrilled that Dunne’s coming back.